칡부엉이는 다른 부엉이에 비해 상대적으로 칡 색의 짙은 잿빛 얼룩의 깃털을 가져서 ‘칡부엉이’라는 이름이 붙었다. 생김새가 쇠부엉이와 유사하지만, 비교적 귀깃이 더 길다는 차이점이 있다. 야행성이기 때문에 낮에는 침엽수림에서 무리지어 가만히 앉아있거나 잠을 자고, 밤에 활발한 먹이사냥을 한다. 날아다닐 때에는 날개의 퍼덕거리는 소리가 나지 않는 특징이 있다. 번식기에는 작은 소리로 시작해 점차 큰 소리로 새벽 동이 틀 때까지 우는데, 먼 곳에서는 나무를 톱으로 자르는 소리로 들린다. 올빼미류는 육식성 조류로서 이 새는 주로 들쥐를 잡아먹으며 두더지나 작은 들새, 박쥐도 잡아먹는데, 이렇게 오염된 먹이를 취식하여 번식률이 저하되고 있는 추세이다. 먹고 소화되지 않는 뼈나 털은 덩어리 채 뱉어내기 때문에 둥지 주변에 토사물이 많이 발견된다. Long-eared Owls are referred to in Korea as ‘Kudzu owls’ because they believe that there is a distinct resemblance between the pattern and coloring and these owls. They are also, of course, referred to as Long-eared owls because their ears are longer than those of other native species of owls. Long-eared owls belong to the family Strigidae, which is the largest of the two owl families in existence. 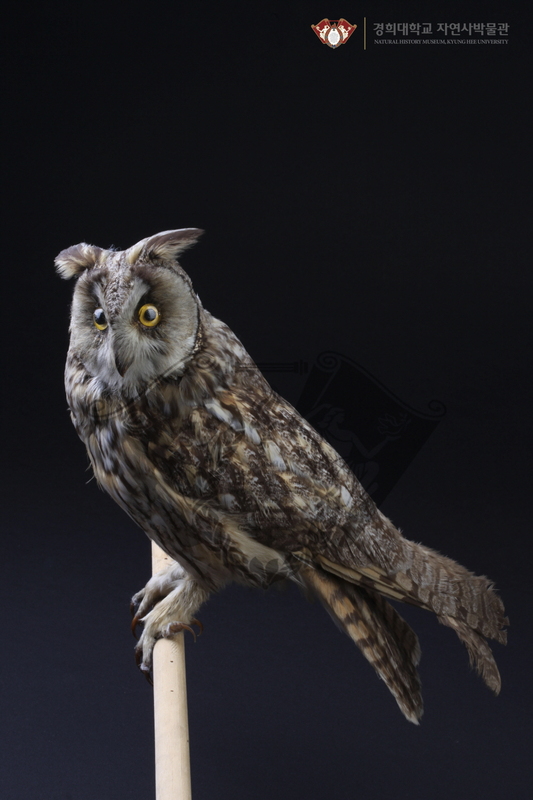 Long-eared owls famously are a breed of animal that give up owl pellets. Owl pellets are produced by several species of avians, including non-owls, and they consist largely of the not digestable portions of the prey that they eat --things such as bones. They usually live in groups of 10-20 owls. Owl populations are being adversely affected by a number of things. Some of it is the general depletion of their habitats and their prey, but sometimes even things such as the poisoned or sickly prey that they eat can cause a dramatic fall in their reproduction rates.